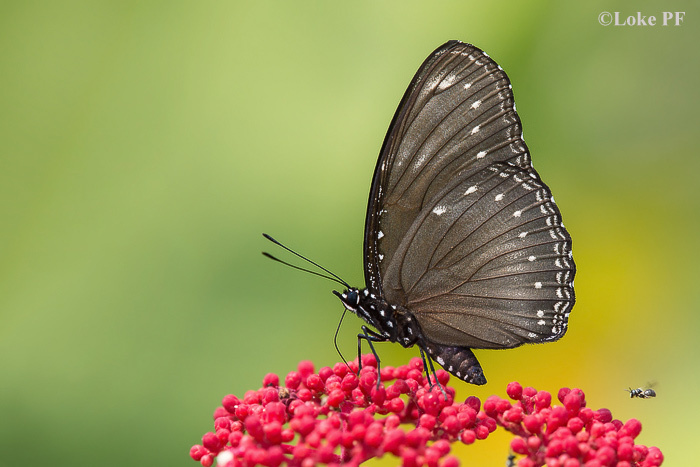 A break in the haze over the weekend prompted some ButterflyCircle members like Loke PF to get out in the sunshine and relatively clear skies to go butterfly-hunting again. In the aftermath of PSI levels of greater than 400 points on the index (which spells 'hazardous' air quality conditions), the sunshine and blue skies over Singapore on Saturday afternoon was a great relief. The winds changed direction and blew the haze northwards to Malaysia, even as the National Environment Agency in Singapore cautioned that it would only be a temporary relief as the winds would likely blow the smog down south again soon. Anyway, here is an excellently-executed shot of a Malayan Eggfly feeding on the flowers of Leea rubra. The added bonus of a stingless bee floating just behind and below the butterfly makes the shot an outstanding one. The Malayan Eggfly is locally common and is well known for the behaviour of the female butterfly laying up to 100 eggs at one go, and then standing guard over her eggs until her demise.